Gastroenteritis is the term used to describe inflammation of the gastrointestinal tract, usually considered infective in origin (although often non-infective). It is a transient disorder and refers to a combination of symptoms such as diarrhoea, vomiting, and abdominal pain, although not all have to be present in order to make the diagnosis. The most common cause is viral, contributing to 30-40% of gastroenteritis in developed countries. Patients will typically present with a cramp-like abdominal pain and diarrhoea (with or without blood or mucus). There may be associated vomiting, pyrexia, night sweats, and weight loss reported. On examination, the patient will often be dehydrated (of varying severity) with potential pyrexia. In rarer cases, patients may present with specific complications of certain causative organisms, such as Guillain Barre syndrome, reactive arthritis, or haemolytic uraemic syndrome. Investigations are not necessary for most cases as the condition is usually self-limiting. However, a stool culture is often warranted, especially if cases with blood or mucus in the stool, if the patient is immunocompromised, or if severe or persistent. In the UK, both food poisoning and infectious bloody diarrhoea are notifiable diseases and it is the duty of the diagnosing doctor to notify the appropriate body. Certain organisms are also notifiable (Campylobacter and Salmonella), however this is the duty of the laboratory to notify the Public Health body regarding this. Figure 1 – Rotavirus particles. Rotavirus is a common cause of diarrhoea in the young. 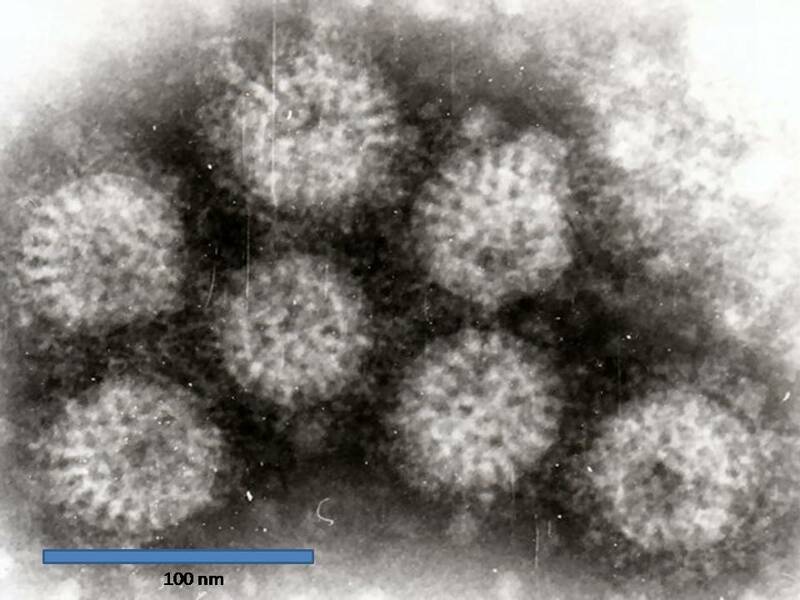 Norovirus: This is a RNA virus. It is the most common form of viral gastroenteritis in adults and presents with abdominal cramps, watery diarrhoea, and vomiting. It usually lasts about 1-3 days. Rotavirus: This is a double stranded RNA virus. It is the most common cause of severe diarrhoea among infants and young children and generally lasts less than a week. Infection in childhood generates life long immunity. Adenovirus: This is a DNA virus. Another common cause of diarrhoea in children. 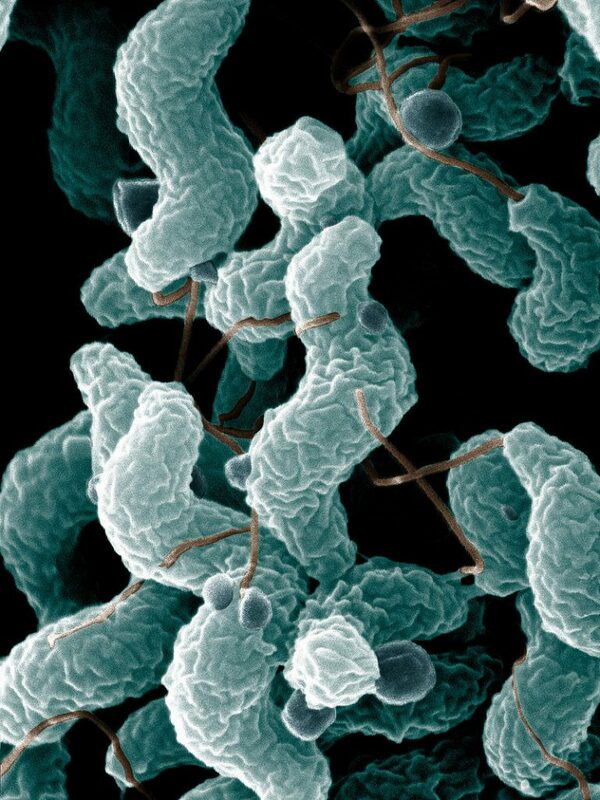 Campylobacter: A Gram negative bacillus. The most common cause* of food poisoning and typically results from the ingestion of affected chicken, eggs, or milk. There may be a prodrome of fatigue, fever, or myalgia followed by nausea, abdominal cramps, and diarrhoea. Salmonella: A Gram negative flagellated bacillus (two serotypes most commonly associated with gastroenteritis, S. typhimurium and S. enteritidis). It is transmitted through undercooked poultry or raw eggs, causing fever, nausea, vomiting, abdominal cramps and bloody diarrhoea. Figure 2 – Scanning electron micrograph image of Campylobacter jejuni, showing its characteristic spiral shape. 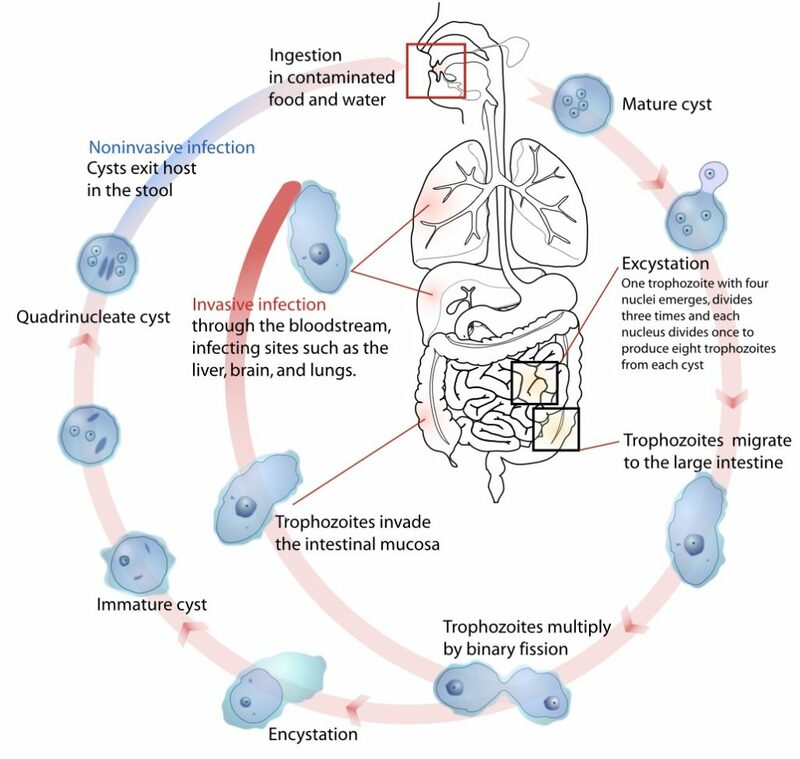 Cryptosporidium: This is a protozoan which typically causes a self-limiting watery diarrhoea with abdominal cramps (however may be life threatening in those who are immunocompromised). Diagnosis involves stool culture for ova, cysts, and parasites. Entamoeba histolytica: This organism is responsible for amoebiasis. It is acquired from the ingestion of food or water contaminated with faeces, presenting with symptoms of bloody diarrhoea, abdominal pain, and fever. Stool culture for ova, cysts and parasites is required and recommended treatment is metronidazole or tinidazole. Giardia intestinalis: This organism is responsible for giardiasis. Transmitted through direct contact or faeco-oral route, it can cause acute disease (diarrhoea, fever, fatigue, nausea, and bloating) or chronic disease (steatorrhoea, malabsorption, and weight loss). Stool culture for ova, cysts and parasites may show trophozoites (‘tear drop’ shaped on microscopy) and duodenal biopsy can reveal villous atrophy. Management advised is usually metronidazole or tinidazole. Schistosoma: This organism causes schistosomiasis. Acquired from contaminated water, acute schistosomiasis develops about a month after the initial infection, presenting with fever, malaise, abdominal pain, bloody diarrhoea, and hepatosplenomegaly (which can develop into chronic liver disease and portal hypertension). Eosinophilia may be seen on full blood count and a stool culture for ova, cysts and parasites is required. It is treated with praziquantel. The main pathogen for hospital acquired gastroenteritis is C. difficile. It is a Gram positive organism and typically develops following broad-spectrum antibiotics (particularly cephalosporins), disrupting the normal microbiota of the bowel. 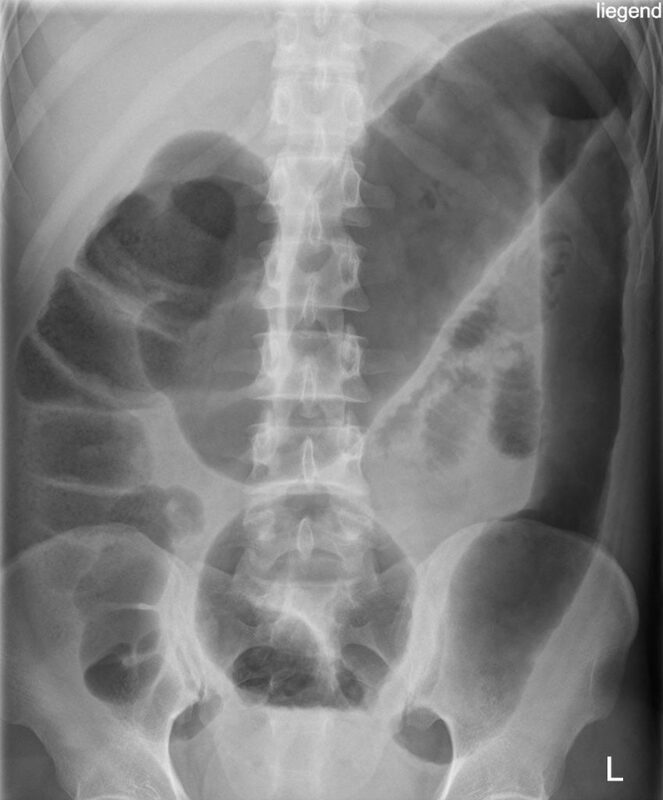 The bacteria produce exotoxins A & B, causing an inflammatory response in the bowel that results in an inflammatory exudate on the colonic mucosa with intervening areas of normal mucosa, This culminates in severe bloody diarrhoea, which has the potential to develop into toxic megacolon (severely dilated bowel with high risk of perforation). Investigation requiresstool culture specifically including C. difficile Toxin (CDT); results may report the presence of the bacteria but not of the toxin, in such cases these reports should be interpreted relative to the clinical picture.Treatment requires IV fluid rehydration and oral metronidazole; vancomycin can be started in severe disease or if no improvement is seen after 72 hours. Gastroenteritis ceasing within a few hours is likely to have been caused by what? What type of bacteria is E. Coli? What pathogen most commonly causes Travellers' Diarrhoea?